Hi everyone! My family and I are back from a week at Walt Disney World and I wanted to share a project with you that I worked on for a couple of weeks. I made 15 of these for my stamp club member's Christmas gifts. I couldn't show them earlier because I'm having a luncheon with my 2nd group today. The first group and I met two weeks ago before I left for WDW but my other group couldn't meet that day. It's been killing me, not to be able to show these and let you'll see what kept me so busy that I didn't blog much in late November and December but since most of you'll are crafters I knew you'd understand. I have much to post about our WDW trip, but I'll save that for next week. On with the project! I found these really cute p hoto cubes at a local craft store. I knew I could do something with them but I had no idea what. Then if finally dawned on me that I should alter them. The first thing I did was to remove all the plastic pieces where the photos go and paint them. I painted them all white with craft paint. After they dried, I cut designer series paper to fit the edges and top and then used Mod Podge to adhere the paper to the wood. 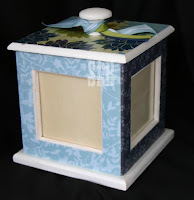 I let that dry 24 hours to prevent buckling and then did two coats of Mod Podge on the top. After that I found some wood knobs and attached them t o the top of the cube for easy spinning. 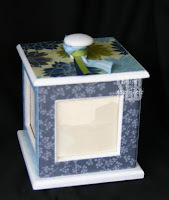 I added matching ribbon and viola a cute altered photo cube that I hope my club members will fill with their favorite photos and enjoy for years to come! My only regret is that I didn't take a picture of EACH cube before I wrapped them. They were all done with different papers so they all looked so different. If you have any questions or need better instructions, just send me an email and I'll respond. 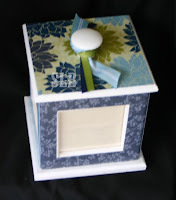 This cube features Urban Garden Designer Series paper from Stampin' Up, Baja Breeze and Kiwi Kiss ribbons also from Stampin' Up! These are adorable!! Love that paper even though I never purchased any-you can't buy it all right? What a great idea & gift!! These are wonderful!!! Great work, and a great idea!!! Thanks for sharing!